Sell Your House Fast Fresno - We Can Help! Hey, this is Chris Williams, owner of ibuyhousesfresno.com. 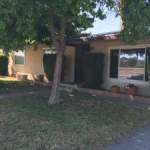 If you’re looking to Sell Your House Fast and you’re in the Fresno and Madera areas, you have come to the right place. I just wanted to make this quick video to tell you about how we can help you if you’re looking to sell your house fast here. What we do is we buy houses cash, and we try to provide the absolute best solution for you, for your family members, for your clients, or whoever needs to sell fast. Just a real quick rundown of what our program looks like and how it could benefit you. First of all, all of our purchases are full cash, so that means that we’re not waiting on a bank, we’re not waiting on an appraisal. If we like the house we can just come in and buy it because it’s our money. You will never pay for any repairs because we buy house as-is. You don’t even have to clean the house before closing escrow. If it’s trashed, you don’t even have to get all the trash out. We just take it as is, which is very beneficial for you. You will never pay any real estate commissions, none whatsoever, unless you’re already listed with a real estate professional. Even though I am licensed, when we buy your house, there is absolutely no commission to be paid by you! There are no fees. I don’t know why anyone would charge a fee, but some people do. We’ll never charge you any fees. There’s no closings costs or escrow fees. We cover all of that. Because of our great relationships with the local title companies and escrow companies, we’re able to provide that solution & opportunity where we can actually cover your closing costs and save you a few more grand. It’s a fast close. Typically, we close from 7 to 21 days. We have definitely closed faster than that but it all depends on the circumstance. And another thing, if you’re a homeowner and you need a little bit of time to move out after we close escrow, we can work with you on that as well. If you need to sell a house fast, whether you’re in a tough spot or you just want a cash offer, give me a call. 559-408-5977. Here are some situations that we typically buy in. You don’t have to be in one of these situations, but if you are, we know exactly what to do to help you out. Our goal is to meet you where YOU are at and provide the best solution for you. If your house has bad tenants. A lot of people don’t like going to their rental properties because their tenants are jerks. They treat their landlord and property like crap. If you’re dealing with that, we’d love to help you out. If the house needs too many repairs, more repairs than what you are comfortable with handling, it’s okay. We like buying fixer uppers. Not all the houses we buy are fixer uppers, but we really love buying houses that need a lot of work. If your house needs too many repairs, it’s okay. We can buy your house today and save you from those headaches. If your house is either going through probate or has gone through probate, we can still buy the house and help you navigate through that process. If you just inherited a house, we have experience dealing with that too. If your house has back property taxes, we can come in and help you out with that. If you’re in the middle of an eviction, or if you’re dealing with a tenant who hasn’t paid in months that needs to be evicted, we can come in and we can take care of that. We can take care of you in that situation. If you’re going through a bankruptcy and now you have assets that you need to sell, this is a great solution for you to just free up that cash as quickly as possible. If you’re going through a divorce and need to sell a house, I know that can be a really sticky situation. We have bought a lot of houses from people who are going through a divorce and helped them out. If you’re needing to sell because you’re downsizing or relocating, whether you’re downsizing or relocating within the city or going out of town we can help you today by buying your house. This is a great way to sell the house and then have a couple weeks to move out after closing escrow. So if you need to sell a house fast, whether you’re in one of these tough spots or you just want to a full cash offer, give me a call. 559-408-5977. I can make you a fair, full cash offer to buy your house today, or go to ibuyhousesfresno.com. Hope to speak with you soon. I would love to help you out. I would love to buy your house today.